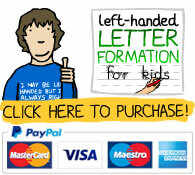 Click the button to purchase your left-handed letter formation guide for only £3.95. 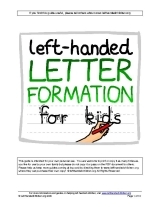 One of the most common problems we hear about from Left-Handers Club members and people who contact us for advice is that their young children are having trouble with writing , cannot seem to get the hang of certain letters and are getting in trouble with their teachers. 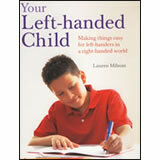 We have produced this book to help your left-handed child form the letters of the alphabet with the minimum of difficulty. 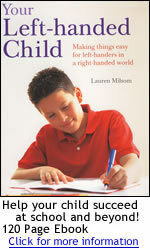 Problems can arise because right-handers naturally “pull” their pen across the page and can easily make left to right strokes following the direction of writing. Left-handers are “pushing” their pen across the page and when making left to right strokes this can lead to the pen or pencil digging in to the paper so it does not write smoothly. 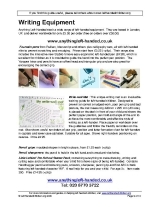 If you are not aware of the differences (like most right-handed teachers!) 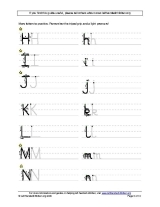 this can cause confusion and great frustration as your child starts to write. 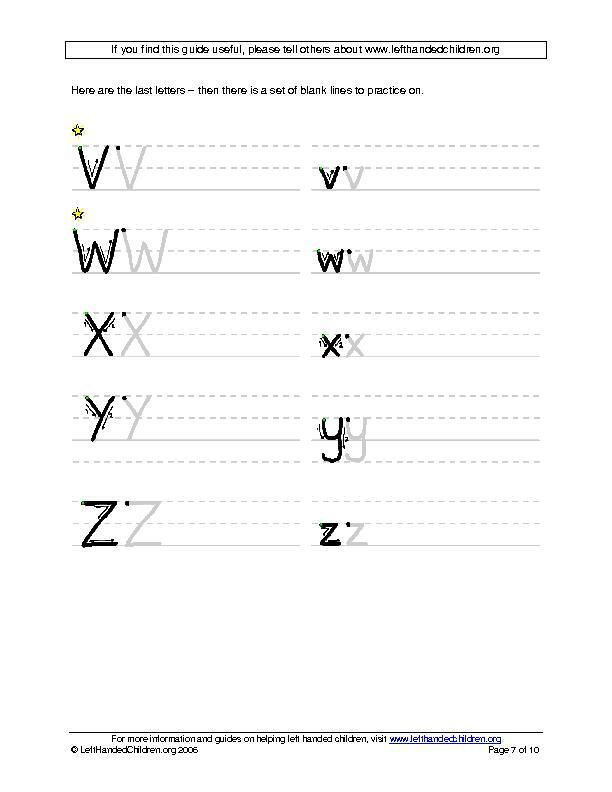 With our guidance and the letter practice sheets, you can stop this ever becoming a problem for your child. 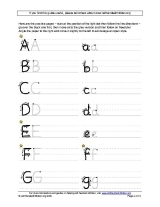 You and your child can start by going over the black letter, starting at the light dot and following the arrows, then move on to the greyed version and then go freestyle between the guide lines (the letters are spaced across the full A4 / Letter page in the workbook). 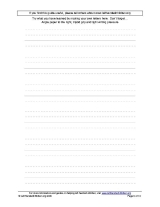 Once you have downloaded the book, you can print or copy the guide sheets as many times as you like for your own use. 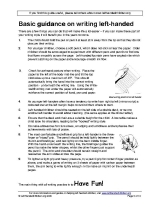 There is even a full page of guidelines with no letters on for more advanced practice. 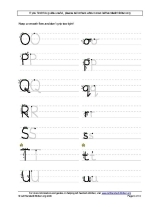 These are the pages inside the book and it is supplied as an Adobe PDF file with full printing rights - you could be having fun using it with your child within minutes! 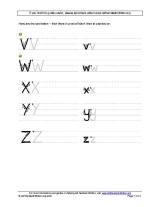 If you would like to download a full size sample sheet of the letters V to Z as a low resolution image so you can try it out and see how you get on, Right Click Here, then Save Picture as.. to save the image to your own computer so you can print it. 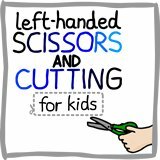 But don't miss out on the advice and tips on left-handed writing that will get your child off to a great start and keep them on track as their writing develops. 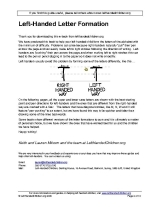 Click the button below to get your own copy of the full letter formation guide for only £3.95 and print out the high-resolutions guide pages from the PDF file as often as you like. 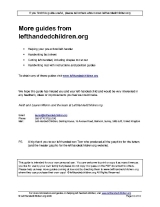 As soon as your payment is made you will be returned to the page on our site where you can download your guide immediately - you could be enjoying it with your child in less than 5 minutes!